I need some few users (about 3) to help me test the performance of my Air Calendar Lite (without scheduler) plugin that I will be releasing in about 2 days time (assuming the testing is successful). What is Air Calendar Lite plugin? It is a plugin based on the FullCalendar library (same library the bubble calendar uses). It’s goal is to address 3 main concerns with the current bubble calendar plugin. Performance : Many users complain that the bubble calendar is too slow. This is because the calendar loads all events on page load. Instead Air Calendar loads events based on demand based on the current view by exposing the current view and its end and start date (this can be used to constrain the events fetching). Customization : Air Calendar doesn’t come with any navigation buttons. Instead it exposes workflow actions allowing you to design your own buttons and layout. The only thing not customizable is the calendar grid (you can actually customize that with CSS). Features : FullCalendar has tons of features most of which the bubble calendar doesn’t expose. The goal of Air Calendar is to make available the most desired features. The bubble calendar is based on FullCalendar v 1.6.4 (released in 2013). FullCalendar was completely re-written this year. 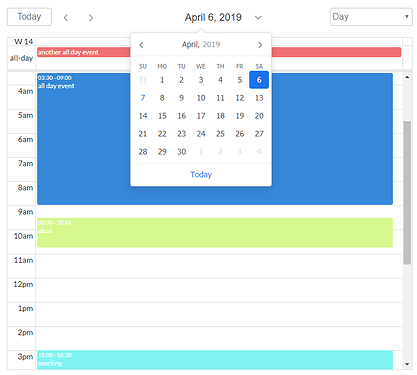 Air Calendar is based on the latest FullCalendar v4.0.1 released just about 3 weeks ago, so it is very current. Can I help you test? Be currently using the Bubble Calendar in either a production/live application. Currently experiencing speed issues with loading events into the calendar. Has several hundreds ( ideally thousands) of calendar events for a long period of time (over 6 months) in their database. Has about 10 minutes to spare. You will need about 5 minutes to read the documentation and 5 minutes to setup the plugin. Read a one page documentation on how to install and setup the plugin. Create a blank page and add the calendar. Compare the speed of events loading to your existing Bubble calendar. Send me your results, impression, recommendation, etc. As a thank you for your time, you will get to use the plugin free of charge for any one application of your chosen. Does this come with the scheduler? No. That will be a separate plugin (much higher price because of the licensing). Ok i’m in, what should I do? Just send me a private message with the name of the your app you want to use to test. I will grant the app access to the plugin and notify you. Sure. See demo and editor page and documentation ( incomplete) links below. Very excited by this. I’m actually happy that you are finally considering charging for your plugins, especially this one, because it simply means (well anyone would assume) that any future bugs will be swiftly fixed. Also, I saw some mention of a “Pro” version of this elsewhere on the forum and I know that you’re still in the preliminary stages, however, could you possibly shed some light on what the main difference(s) will be between the “Lite” and “Pro” versions? For example, performance, feature or customization differences? because it simply means (well anyone would assume) that any future bugs will be swiftly fixed. Yes. If i take even your $1, i’m obligated to abide by the SLA. could you possibly shed some light on what the main difference(s) will be between the “Lite” and “Pro” versions? The main difference between them is that the Pro version will have the Scheduler (Resource/Timeline view) plus all features of the lite. The reason why i’m creating two versions is the pricing. The Pro version will require me to purchase a developer license from FullCalendar to be able to include the Scheduler in the plugin. Therefore I will have to factor that cost into the plugin. Thank you for this great plugin @seanhoots. I had the opportunity to test it and I can confirm a huge increase in speed. New Calendar Plugin: 1 to 5 seconds to load. Very fast times for weekly views (1 - 2 seconds approx - 20 events fetched) and reasonable good times for monthly views (4 - 5 seconds - 100 events). I extensively use calendar throughout my apps to show both weekly timesheets and future events. This is certainly a game changer and will help keeping our clients, which are constantly complaining about speed issues when tracking their employees work. for helping with the testing and providing your results. For those that might want to know, @starnapp’s database had about 4,400 total event records and the app has constraints on the search query. I’m waiting for the results from some other testers and if they’re also good I will now be happy to release it. Thanks to everyone who helped with the testing or showed interest. I’ve gotten enough testers and really happy with the results of the performance. Finishing up the documentation and will publicly release it soon. Is this ready to publish yet? Hey @seanhoots this plugin has been great! The version you had i think didn’t have this functionality but the current version (unpublished) has functionality to allow you to determine what clicking on the more like does. Also there is a new event trigger for when the more link is clicked that allows you to create your own workflow actions. There are three main direct options. Do nothing. This option allows you to do whatever you want. So you can use the trigger event and define your own custom workflow (see demo below). I am using the ‘More events is Clicked’ Workflow, but I would like to access the Date that the More Events click resides on to use in an Action within the Workflow. Ah I see what you mean. 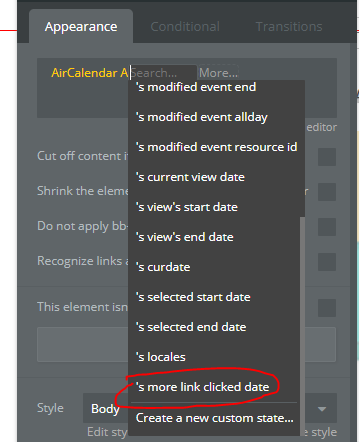 Technically a click on the more link is not a click on the day and that’s why you couldn’t assess the day with the clicked date state. I’ve just updated the plugin to add a new state, more link clicked date , that will give you what you want. @seanhoots will you be releasing the pro version of this as well? @dudders9, yes but the lite version will be released first.